WINNER OF THE TRAILER INNOVATION AWARD 2017: The SAF INTRA CD TRAK supports the truck on inclines and difficult terrain, using a hydraulically driven Motor – simply by pressing a button. For the first time as standard in the trailer: The hydraulically driven SAF INTRA CD TRAK axle brings drive to the trailer – simply by pressing a button. The new SAF INTRA CD TRAK is optimised for trailers in the 9t standard range – both on-road and off-road. Specially developed for dump trailers and walking floor vehicles operating in the area of construction sites or landfills, the drive axle supports the truck on inclines and difficult terrain with its integrated additional drive. 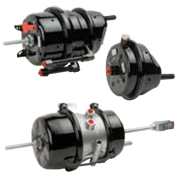 The special motor takes the required performance precisely where it is needed – right to the trailer. 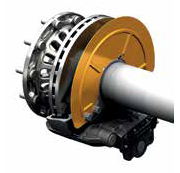 Here the drive axle carries the full axle load and is able to transmit complete drive torque. The hydraulically driven motor is long-lasting and low in maintenance, thereby ensuring that the new trailer axle has an exceptionally long service life. For a complete overview of all available components and possible combinations of suspension types, axle versions, ride heights and weights etc. please see the Design manual. Our GUARANTEE OF COMPETENCE takes the worry out of equipment concerns: protection up to 1 million km and 6 years on the complete suspension system according to the SAF-HOLLAND guarantee conditions. The specially coordinated shock absorber with specific characteristics is positioned in the center of the hanger bracket and with-in the functional suspension arm, thus protecting it from stone chipping and other road debris. Our specially designed 3D bushing element is integrated into the functional suspension arm and provides an optimum of ride performance. 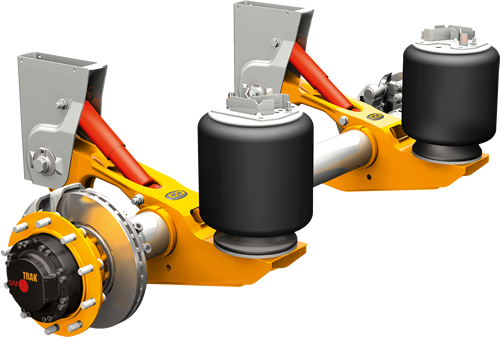 Our design incorporates the functional suspension arms and axle beam into one unitized and maintenance free component. This indestructible design provides additional benefits such as: no extra mounting parts, such as axle seats and U-bolts, no re-torquing of screws and nuts. The very narrow hanger bracket is symmetrically designed. This saves weight and allows easy installation. The patented SAFE-GUARD-DESIGN of the functional suspension arm reliably protects the brake chambers from damage. We use great care in long-term corrosion protection on particularly exposed parts, such as hubs, hub caps or screw connections as well as wheel bolts and nuts. Standard features include: uniform bearings, ABV-preparation, integrated rim system, specific weight reduction, cathodic dip coating process of axle and wheel hub. 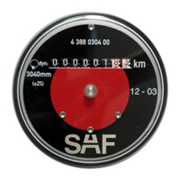 With this hubometer the operating times of trailers can be documented precisely and reliably. The same strict quality guidelines apply to our brake chambers as for all SAF components. We are using high quality internal components for our brake chambers so that you can depend on the long and secure function of this component. 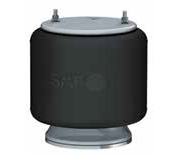 The robust and completely surface coated housing provides additional safety. 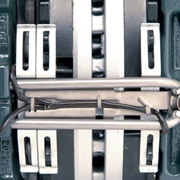 For an additional advantage the air connections are fully integrated on the SAF brake chambers. Order your spare part with just one click! Extended maintenance intervals for screw fittings of the 3D spring-loaded pivot bushing and shock absorbers on aluminium and stainless steel hanger brackets of the SAF INTRA and Modul air suspension systems.